Are you already dreading the amount of preparation looming ahead for Christmas? To make it easier to get into the festive spirit this year, why not start getting organised now? ’tis almost the season to be jolly – unless of course you’re a mum. Before you can even think about sitting down with a mince pie and mulled wine, you’ve got presents to buy, decorations to put up, nativities to prep for, school holidays to manage, food to buy (including said mince pies)… you get the idea! 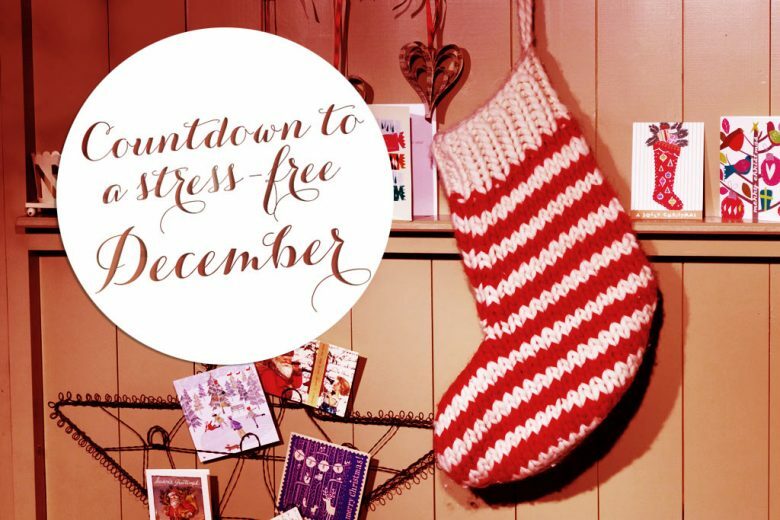 To help you prepare for a more enjoyable Christmas, freelance journalist and mum of two Samantha Downes shares her tips for a stress-free December. When you’re a working mum the festive season can be anything but. Juggling work and childcare (not to mention present buying and going to the odd drinks do or friends’ meet up) can all add up to one big old bunch of stress. This year, why not make things a bit easier on yourself with a bit of preparation? So if there are any last-minute ‘dos to go to/presents to buy/food allergies to cater for/glasses of Baileys to sup, you can enjoy them knowing that almost everything else is under control and the only thing you have to worry about is food. To get a head start on the festive season, between now and late November get moving on these tasks. Make a list of everything that you need to do and buy, and give yourself a deadline of the end of November/first week of December. Set a list up on your smartphone and add to it when you think of something. You don’t need to be too realistic – if you do plan on trying a yoga class before New Year’s Eve, stick that on it too. Remember to tick off as you go, that way you can have achieved something, even if it was buying stamps, or sorting out the school fair mince pies. There will be moments when you find yourself running around madly trying to get everything done. But if you’re doing it now, you won’t feel quite as stressed as if you had left everything until Christmas Eve. It could even be fun. Step away from the chocolates, the wine and the coffee, but only for a while. Give your system a break from adrenaline-inducing (and sleep unfriendly) caffeine and booze, which will depress and dehydrate you. All you need is a couple of weeks off (starting right now) and drink lots of water too. If you can’t be good for that long, give yourself a few nights/days off these a week. It could even help you feel more rested. Second hand book shops, farmers markets and good old Boots and Marks and Spencer with their 3 for 2 offers are your top destinations right now. You can hit these in your lunch hour or in a snatched half an hour before or after work. Instead of stopping for a coffee on my way to the office, I pop into the nearest potential gift shop and stock up. Oh and if you are going to have cards printed, do them now too (see What to do in December). If you are doing Christmas dinner/lunch/supper at yours then now is the time to call in those favours from relatives. Divvy up the purchase of staples like cheese, nuts and crackers, sauces, puddings etc, so that you can concentrate on cooking the turkey and veg – if that’s what you want to do. You may of course want to do your online shopping, or your Marks and Spencer/Waitrose food to order, now. Once November is out of the way, start tackling these tasks. If you’ve lots of family and friends, not to mention having to help your little ones write greetings to classmates and playmates, then get your card-writing in early. And post them as soon as you’ve done them. Seriously, it only takes one evening and an achy hand later and that’s it. You could save time by getting them all printed and pre-signed so you only have to write the name of your loved ones in. Now, not the new year, is the time to do a wardrobe audit. Before you start shopping for an outfit because you’ve nothing to wear, check what you do have. If you really must buy something new, make it shoes or accessories – something that you can wear with other outfits and not just at Christmas. Beginning to feel good about everything you’ve accomplished ahead of schedule? Why not squeeze in some time for you and bring forward your new years resolution to hit the gym, take up a sport or do pilates. If you join a gym now, you won’t have to queue up with the other newbies in January (our gym goes crazy the first month of every year) and you can feel smug when you watch that bloke working out how to use the power stepper. You can also enjoy indulging at Christmas much more knowing you’ve already worked off the calories! Look forward to a relaxed, festive Christmas! With a bit of planning and preparation, Christmas doesn’t have to be the last minute stress-fest it is for so many mums. Instead, you can spread your workload manageably over the next few weeks and look forward to sitting down with your kids on Christmas Eve in front of a cheesy, festive film and feeling smugly full of Christmas spirit (and mince pies)! Samantha Downes is a freelance journalist and the author of several finance guides and books.